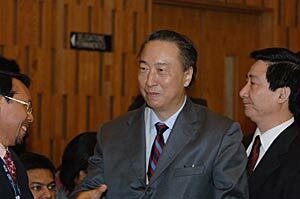 24-10-2005 4:00 pm Zhang Xinsheng, Vice Minister of Education of China and the country’s representative to UNESCO’s Executive Board, was today elected Chairman of the Organization’s Executive Board for a period of two years. Mr Zhang was elected in the first round of voting. He replaces Hans-Heinrich Wrede of Germany, who had served as chairperson of the Executive Board since October 20, 2003. Speaking after his election, Mr Zhang stressed that as “the world is becoming a global village, great challenges and opportunities await us and the time has come for all of us to intensify our commitment for an even stronger UNESCO.” Mr Zhang went on to highlight the need for harmony and synergy between UNESCO’s Executive Board, General Conference and Secretariat to carry out the Organization’s programme. The Director-General of UNESCO, Koïchiro Matsuura, then took the floor and congratulated the Chairman for his election pointing out that Mr Zhang is the first representative of China to be elected to Chair the Executive Board. Mr Matsuura went on to appeal for the support of the Executive Board in the pursuit of the reform of the Organization. Born in China in 1948, Mr Zhang graduated from China’s Military Institute of Technology in 1969 and from the University of Hangzhou where he studied English language and literature in 1977. He went on to complete the Advanced Management Programme (AMP99) of Harvard Business School in the 1980s and, in 2000, was awarded a Master’s Degree of Design Studies from Harvard’s Graduate School of Design. Mr Zhang chaired the 2004 session of UNESCO’s World Heritage Committee in Suzhou (China), a city of which he was twice elected mayor. He holds the post of Vice Minister of Education and is an adjunct professor at the universities of Tongji and Nanjing. The Executive Board’s 58 members, elected by the General Conference, meet twice a year. The Executive Board oversees the implementation of the programmes adopted by the General Conference, UNESCO’s supreme governing body.